Neotech's new Brass Sling offers extra support for many tubas, baritones, euphoniums and other brass instruments which relieves the all-too-common shoulder and arm fatigue. The Brass Sling's patented design supports the weight of the instrument by combining neoprene with an internal control-stretch system to effectively distribute the weight over a larger area. This system reduces the felt-weight of the instrument by up to 50% making practicing or performing for extended periods of time much more comfortable. It also pulls pressure away from the lips as there's no longer the need to use the lips as a balancing point. 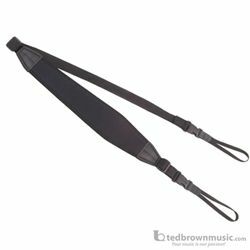 The nonskid surface on the back of the strap means it stays firmly in place and won't slip while performing. As the instrument is now comfortable to carry, there's no need to set it on the ground in between sets so it doesn't matter what conditions you are playing in... be it a beautiful concert hall or roaming the streets at a music festival. When an "extra hand" is needed, the Brass Sling is just the thing! The Brass Sling features Neo-Loop™ Connectors that fasten to the instrument's strap rings or around the instrument's tubing. The Neo-Loop™ Connectors are comprised of a sturdy quick release buckle with a loop of 3/8" webbing for a convenient and secure connection. Once attached to the instrument, simply snap the quick disconnects to the strap and it’s time to play!